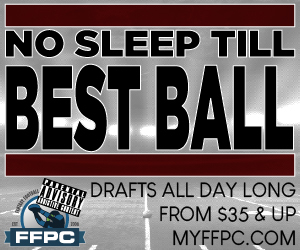 The 2018 fantasy football season is in full swing at the FFPC, and we have the ADP above to help you navigate the waters when you jump into their draft experts (best ball) leagues starting at $35 and up. Finally, you can click on any player to see a scatter plot diagram and see EXACTLY where a player has been selected in every draft in that format. Jerick McKinnon, for example, has been getting selected earlier and earlier over the course of the draft season. FFPC ADP content for 2018 has additional ADP criteria (min, avg, max drafted positions), and also sortable column headers.